If you have one missing tooth, you may be tempted to just ignore the problem since you still have the rest of your natural teeth. However, if the missing tooth is located at the front part of your mouth, your entire smile will be affected – it will look unhealthy and incomplete with that single tooth loss. The rest of your teeth will shift when you lose a tooth, and this can affect your bite. Another problem resulting from tooth loss is bone deterioration. The loss of a tooth root eliminates the stimulation needed by the jawbone, and the bone quality deteriorates in time if the tooth root’s function is no replaced. Do you have a missing tooth? Are you thinking of ways to make your smile attractive again after losing one tooth? A dental implant and a crown can make your smile healthy and complete once more! You can replace a single missing tooth with a dental implant treatment at Life Dental Implants in London. 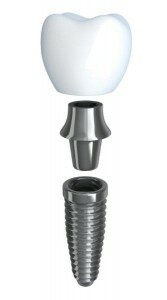 A single dental implant will be embedded into your jawbone to replace the function of the lost tooth root. This implant will then be attached to a dental crown, which is a dental restoration that resembles a cap; the crown will be created to match the appearance of the rest of your natural teeth. The implant and dental crown will work in closing the unsightly gap caused by a single tooth loss, and makes your smile complete and healthy once more.